Discussion in 'Off Topic' started by Dabbleh, Feb 12, 2013. Mod edit: If you want to learn more about IRC in general, have a look here. I feel this guide has been a long time coming, I am fed up of explaining this to people over game chat. I will try and break this down as much as possible. 1. 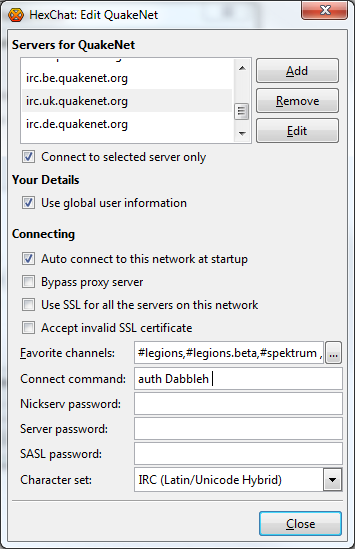 So firstly you want to install a IRC Client, if you do a quick Google you will find loads but Hexchat is my prefered on Windows. If you're on Linux, you are nerdy enough to set this up by yourself... (hopefully). 1.1 Download the appropriate binary (.exe) for your system, x86 (32-bit) and x64 (64-bit), 32-bit will work on a 64-bit system, so if you don't know just get the 32-bit version. 2. This is now the slightly more in-depth part. Setting up all your automated channels and IRC servers. Don't wet yourself, it's easy to set up. Just enter your Alias (The name other users see) in the User Information boxes, the 'Second' and 'Third' choices just matter when someone has already taken your nick. It'll revert to the Second and then the Third, the Username is for NickServ login. 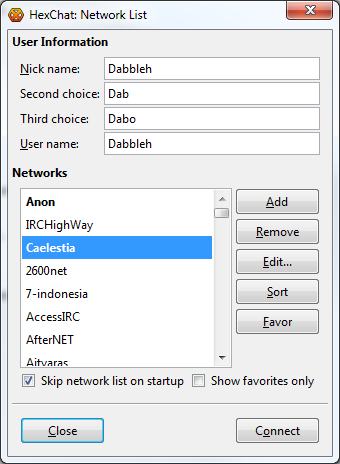 You can tick the "Skip network list on startup" since once we are done here you won't need to use it again, unless adding new networks. 2.3 So on this window there are a lot of things you can ignore. 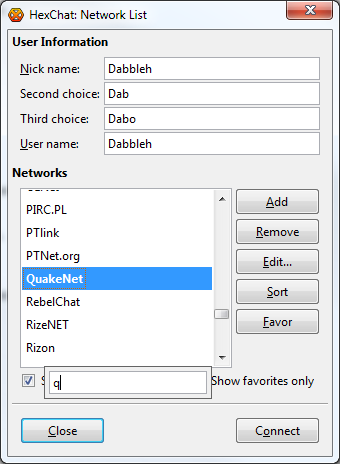 Just tick the "Auto connect to this network at startup", then in the Favourite channels dialog, click the "...". 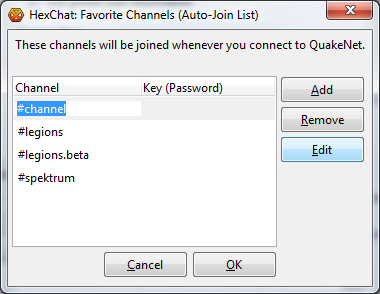 These are the channels you will join automatically, as you can see I connect to 3 channels, #legions, #legions.beta and #spektrum. Add #legions and whatever other channels you want to join automatically. If you still have any questions, feel free to post them below or contact me. JedrekPl, Dino, Bestking and 2 others like this. Would this need an updating or no? No it doesn't? What would make you think that this needs updating when no one has said anything and you haven't had issues following the instructions if you downloaded the program? http://hexchat.github.io/downloads.html, Instead of using his link to hexchat I went online and use that one...which is a bit different. Ah okay I see your point, he's linked to a out of date version of Hexchat. Dabbles get your *chocolate cookies* together. Alright, so Seymour decided to move away from his venerable IceChat when he reinstalled Windows on his new SSD, however, where do I find the Theme Manager for Hexchat? It's supposed to be a separate exe that's included with the main installer, but I've spent a good hour trying to find it to no avail. Help me out, Dabbles! If it isn't there then you probably chose not to install it.